It is believed that Guyana holds the greatest amount of uncharted Amazon rainforest in the world. Around 80% of the country is untouched, tropical rainforest. For a country roughly the same size as Britain, that’s a lot of jungle. We’ve spoken plenty of times before about the rainforest animals of Guyana, and this time we’re focusing on the most obscure among them. Such an environment is simply the perfect living space for a whole host of weird and wonderful creatures. There will be plenty out there that we won’t even have discovered yet, but we still know about a fair few slightly odd rainforest animals; our plan is to share some of them with you now. We’ve included examples of animals you wouldn’t expect to find in the rainforest, and those that are just generally a little odd! We’re also not just talking about the species we’ve seen in Guyana – as we mentioned, so much of the rainforest is uncharted that almost anything could be out there. Everything on our list comes from the Amazon, even if not necessarily Guyana. Need we say any more? Our first entry takes an unusual rainforest animal, and makes it more unusual. 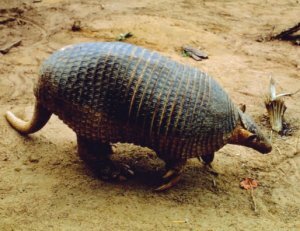 Let’s face it, normal-sized armadillos are ever so slightly obscure anyway – their enormous shells make them look extremely prehistoric, while their faces have something in common with the modern-day kangaroo. Now, taking such an animal and making it bigger is always going to add to its obscurity, and they’re not just “bigger” either; they’re much bigger! They can grow to lengths of up to a metre (4 times their normal size) and can weigh as much as 35kg (5 times their normal mass). These giants burrow, much in the same way as their smaller variants, in areas close to water. If you’re hoping to spot one in the wild, then look for their burrows; the inhabitants won’t be too far away! If you’re not a fan of arachnids, this one probably isn’t for you. Next on the list are our river dolphins … maybe skip to them. Now, this six-legged beast. 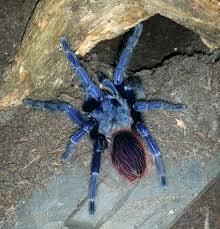 The electric blue tarantula was discovered almost completely accidentally; Andrew Snyder happened to shine his torch onto the bottom of a tree, when a bright blue light reflected back at him. Sure enough, he looked a little closer and realised this was a creature fit for a Marvel comic book. In most ways, this variation of the infamous species is exactly the same as its more conservatively-coloured cousins. The main differences, if you haven’t worked it out by now, are the patches of brilliant blue covering its body. Let’s not pretend, though; this particular rainforest animal is one that anyone in their right mind would be rather wary of, even if you think you’re tough when it comes to spiders. Yes, that’s right, dolphins live in rivers. Sure, they also live in the sea, and that’s primarily why these mammals make the list. Commonly associated more with saltwater though they are, it is possible to find river dolphins in rainforest rivers. An area rife with these guys is also likely to be in good overall health, so if you do see any then you can be reassured you’re in a healthy stretch of water. That said, unfortunately the number of river dolphins is decreasing somewhat; the chances of you spotting one are, therefore, not particularly high. See one though, and there’s a good chance you’ll see a few; they often feed in large groups. The payara, or “vampire fish” is straight out of a horror film. Looking at it, you’d think it had been designed specifically as a natural killing machine. Its two fang-like teeth tuck into the upper jaw while the mouth is shut, hiding its weaponry for the most part. If you’re unlucky enough to get too close to one of these aquatic assassins, though, you’ll soon find out just how dangerous they can be. Should a vampire fish turn nasty, they won’t hesitate to sink their 6-inch teeth into anything that moves, inevitably doing some serious damage. Finally, we’re leaving you with a frog that carries its young on its back until they’re ready to feed themselves. The females hold their eggs on their backs, and the juvenile frogs develop and grow inside a layer of mucus, offering some extra protection. This generous amphibian’s colours allow it to blend in seamlessly with a rainforest environment, helping it evade its numerous predators. That concludes our list of weird and wonderful rainforest animals. There’s plenty more out there, though, and plenty more that has yet to be discovered. 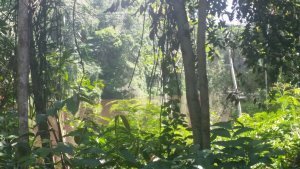 To experience the wonders of the natural rainforest for yourself, and potentially get up close with some of the species mentioned here, book onto our jungle survival course. We can’t guarantee you’ll see anything, but there’s always a bit more around than your average urban-dwellers. The best way to get in touch with us is by emailing us at amazon.bushmasters@gmail.com. We’ll always get back to you as soon as we can, and look forward to hearing from you!